Gwatney Performance is now a Concept Performance Authorized Dealer! We have the BRAND NEW 1500+HP Aluminum LSR Blocks in stock and ready to ship! If you are in the market to do a monster build – we’d love to help! When it comes to making massive power with an LS there are a lot of aspects and trade-offs to consider. While the LS is a capable performer right out of the box, it does have its limits when you start to turn things up. Until now, you could only push the aluminum block so far. High levels of boost or raw power would cause the aluminum to flex or deform under high pressure leaving most builders with only the option of a stock iron or LSX block. But what if we told you there was an aluminum block that could provide all of the additional rigidity of iron without the additional weight? Then you’re going to want to check out Concept Performance’s new LSR block. 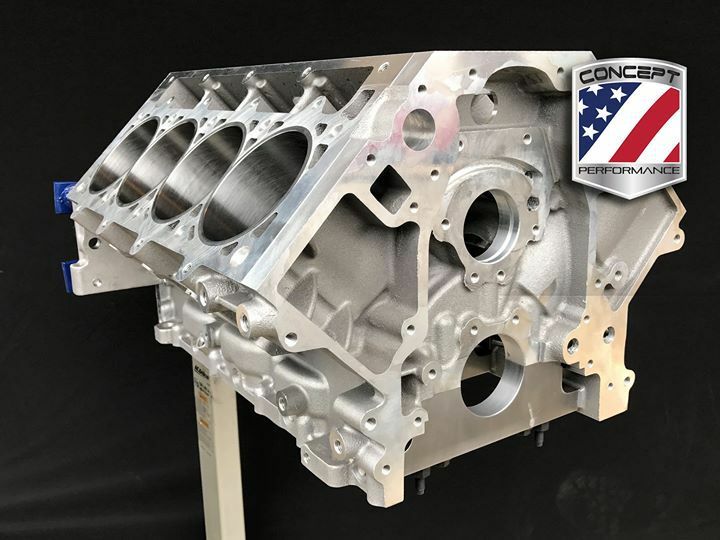 While there are a few other producers of aftermarket, aluminum LS blocks out there, Concept Performance has gone above and beyond to make sure this block is one of the strongest on the market. And though you might not recognize their name immediately, they have been silently producing some of the market’s strongest components for decades. McLoughlin tells us that Concept Performance, who’s owners Cayne and Carlos Inocencio run their own foundry, have been accumulating a lot of data and information on how to strengthen aluminum blocks over the years, all of which has been utilized when producing the LSR. Concept Performance has added gussets to the lifter valley, with individual drain backs, that help add needed rigidity to the mill. They also claim that there is a 40 percent increase in main cap mating surface when used in conjunction with their double cross bolt option (more on that later). The main caps are also constructed from SAE 1045 billet steel, adding to the blocks’ overall strength. Naturally, a priority main oiling system is utilized as well. The block itself is cast from a proprietary 356 T6 aluminum ingot and features spun ductile iron sleeves—again adding to the overall strength and ridgity. The block is available in either standard deck (9.240 inches) or tall deck (9.750 inches) and with or without a raised cam location. The cam bores can accept anything from stock all the way up to 60 mm roller bearings—though this requires additional machining. With the raised cam position, the block can accept cranks as big as 4.600 inches and the maximum recommended bore size is a massive 4.200 inches. McLoughlin tells us, even at maximum bore size, this still leaves .200-inch of wall thickness on the thrust side and .058 inch between the siamesed bores. All said and done, you could have up to a 510 cubic inch LS on your hands if you so chose. The block also comes with a seventh transmission bolt hole to allow for pre-LS gearboxes to bolt to the mill and it is available with ARP main studs. The crank saddle radiuses have also been maximized for optimum windage and clearance. Not surprisingly, the block weighs in at a svelte 113 pounds with its main caps. And speaking of main caps, you might remember that we mentioned that this block will be available with double cross bolt main caps—a first for any LS block. This allows the block to take abuse that any other mill could simply not sustain. McLoughlin tells us that the double cross bolt blocks will begin shipping sometime in February. He has no doubt that it will become the go-to for anyone wanting to retain an aluminum block but make insane amounts of horsepower. The two bolt cross mains will be available on the both the standard- and tall-deck offerings. The China walls have also been thickened to handle more power. But just what does “high levels of power” really mean? That is a hard question to answer says McLoughlin. While Concept Performance can speculate on the blocks’ capabilities all they want, it takes real-world testing to find out exactly what the limits of the LSR really are. Even Concept Performance has yet to really see the limits of what the LSR is capable of supporting, though not for lack of trying. They have been silently shipping units out to their dealers so they can build them and put them to the test themselves. So far, they have yet to lose a single one. That’s right, this revolutionary new block was on display at PRI, right under our noses, and we somehow missed it. However, McLoughlin says they were there more to attract dealers rather than to market directly to customers. Concept Performance won’t be selling the LSR directly to customers, they will utilize dealers throughout the country to distribute their block. Luckily, some of the vendors might sound pretty familiar to you: Scoggin-Dickey, Lingenfelter, and CBM Motorsports, and Gwatney Performance just to name a few. In the mean time, we will be anxiously waiting to see what kind of power levels this thing can really support. “We didn’t really invent anything, we are just reapplying proven theories and fixes to optimize our offerings,” McLoughlin said. We would love to eventually see an offering for the LT series as well and we asked McLoughlin about the possibility of one eventually coming down the line. “We could definitely see a LS-LT hybrid block somewhere down the line but, as of right now, it’s not really in the foreseeable future for us,” McLoughlin said. But whether we see an LT version or not can’t take away from the fact that this is one of the most capable aluminum LS blocks we have seen in a long time. So, do you have what it takes to push the limits of the LSR and find it’s breaking point? Be sure to send us video or at least pictures if you do! I have 07 LS2 with corsa sport and CAI. Thinkin cam and headers but want to keep it VERY driveable. Go to Ky and Tx.,so want to set cruise to 80 and be ok. Think u guys can help??? Hey Scotty. We offer a cam package for the C6’s that would include everything needed for the cam swap. We’d prefer to discuss this over the phone, so we could ask a few more questions to determine the perfect fit, but if you were wanting a performance cam w/ good drivability – the 3 Bolt SS1 cam would be a great fit. If you were wanting near stock drivability, and were looking for smaller gains and a choppy idle – we’ve got some low lift cams that would be a great fit. Give us a call sometime!